Kim’s love of animals started when she was a child growing up in Michigan. She realized early that she did not want to pursue a career as a veterinarian, but instead become an Animal Keeper where she could work closely with animals and build relationships with them through training and enrichment. To accomplish her childhood goal, Kim attended and graduated from Michigan State University with a bachelor’s degree in Zoology. Currently, she is a first year graduate student through Miami University and is enrolled in the Global Field Program which involves traveling abroad once a year to learn about conservation issues in the field. A program that will not only advance her knowledge of animals, but also provide her with the background to converse with others about conservation concerns around the globe. 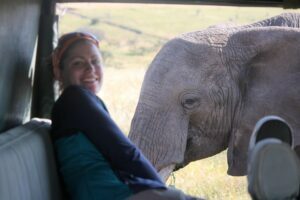 Aiding the fight for conservation is the reason Kim joined AAZK back in 2008. She wanted to be able to “contribute to conversation outside the realms of my keeper position”. And contribute she has. 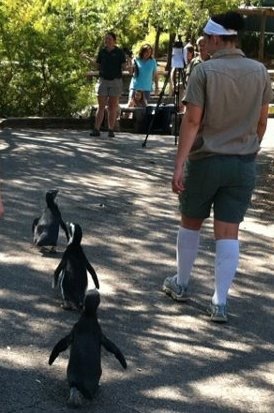 While working at Dallas Zoo, she joined their AAZK chapter and quickly got on board in management and fund raising. In 2010 she was the Dallas AAZK secretary, 2011 the Dallas AAZK Vice President, and in 2012-2014 the Dallas AAZK President. While in the Dallas AAZK chapter she was also a committee member for their Running for Rhinos event and created a CandyGram fundraiser. Kim currently holds the position of Secretary in the Brookfield AAZK chapter. Since holding that position she feels that the experience has helped her to “work better as a team and learn how to successfully delegate tasks if necessary.” In addition to her responsibilities as Secretary, she also is a member of the stewardship committee. She is passionate about AAZK and wants to do as much as possible within the Brookfield organization in order to gain the needed knowledge to help run a successful AAZK Chapter. The Bowling for Rhinos event however, is dear to her heart because she had the opportunity to visit the Lewa Wildlife Conservancy and was able to see first-hand where the money goes and what type of difference it makes. In 2016 she co-chaired a successful Brookfield AAZK Bowling for Rhinos event. Her ultimate goal is to make our chapter’s Bowling for Rhinos even more successful. She would like the chapter to be in contention to win trips to Lewa in Kenya and Indonesia. Despite Kim’s hectic job schedule and her duties as the chapter’s secretary she does have some free time for herself. She uses some of that time to explore the museums and parks around the Chicago area. If possible, she will go for a quick weekend getaway and pursue activities what will take her outside as much as possible. However, she does admit to being a bit of a couch potato once and awhile and I would guess that she snuggles up with her two cats, Kali and Kazi, both of whom were zoo strays that she took in and gave a good home. Brookfield AAZK feels very lucky that Kim has joined our chapter and she is already making a difference with her dedication to the organization and its fund raising for animals and conservation.